Dine at a quaint inn on Chebeague Island in Casco Bay. With a focus on local ingredients, the restaurant at Chebeague Island Inn offers seafood and lobsters caught off the coast and delivered daily, as well as fresh produce from the Chef’s Garden. The restaurant is a popular spot for boaters, guests and locals, so reservations are encouraged. Cliff Island is the smallest year-round island in Casco Bay. Visitors enjoy bicycling on the island's dirt roads. There is a general store with fuel for boaters, and a year-round market with a cafe serving breakfast and sandwiches Memorial Day weekend through September. Enjoy the newly expanded & renovated pub & bar featuring a large selection of Maine craft beer & signature drinks, great food & spectacular views. Enjoy live weekend entertainment on the deck! Call 207.833.2818 for large groups or special events. TASTE the delicious food from their new menu, much of it being caught in the surrounding waters while enjoying one of their 20 craft beers on draft! SEE all the beauty that surrounds you! FEEL the sand on your feet when picking seashells on our shores! HEAR the crash of the surf or the lobster boats hauling their traps while sipping a signature drink on the deck! SMELL the sea air and the comfort it brings as you sit on the deck or in the new open air expanded pub! Just off the coast of Portland, Diamond’s Edge Restaurant overlooks Diamond Cove on Great Diamond Island. Formerly an artistic retreat community and later the historic site of Fort McKinley, Diamond’s Edge remains rich in charm and history. A favorite among locals and visitors alike, Diamond’s Edge Restaurant is the perfect spot for a relaxing lunch or dinner featuring local seafood, New England favorites and amazing views. DiMillo’s is one of the largest floating restaurants in the country, with an overall length of 206 feet and a beam of 65 feet. Because it is surrounded by water, every table offers spectacular views of Portland Harbor. Their outside decks are great spots to see the sights while enjoying a meal or cocktail. Located minutes from Portland’s working waterfront, they specialize in Maine lobster and they serve some of the freshest seafood in New England. Located in the heart of Casco Bay at Handy Boat Marina, the Dockside Grill offers fresh, fun and flavorful New England fare with a modern twist. Their seaside location offers spectacular views of Casco Bay. The downstairs dining area has a wrap around mahogany and stone bar, which opens up to an outdoor patio. Wall-to-wall glass garage doors make this waterfront location like no other. Find yourself lost in the ocean breeze, comforted by the surrounding islands and engulfed in our excellent menu. In the upstairs the dining room there is a large bar and lounge, as well as, an intimate dining room. Both sides of the upstairs dining space open up to a cocktail deck perfect for taking in the panoramic views. 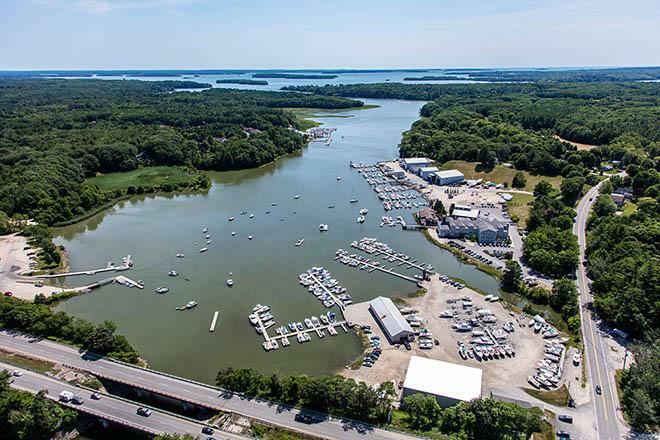 Family owned and operated business for nearly 50 years, the Dolphin Marina and Restaurant is a great spot for seasonal boaters and day trippers. They specialize in Maine coastal fare, including Maine lobster dinners, fresh, local seafood, and hand-cut steaks. Don’t miss their famous fish chowder, lobster stew, and blueberry muffins. Their commitment to using fresh, local products and providing a casual and welcoming atmosphere has continued to make the Dolphin a mid-coast favorite for locals and visitors traveling by land and sea. The beautiful waterfront location is on the tip of Basin Point in South Harpswell, at the water's edge of Pott's Harbor. It offers unrivaled views of Casco Bay and its many islands. Enjoy scenic islands, landmarks, and even a lighthouse from their warm and welcoming dining room. To contact the marina upon arrival, call (207) 833-5343 or radio VHF Ch 9. A short distance from the southern tip of Harpswell Neck, Eagle Island is open to visitors between 10AM and 5PM, from June 15 through Labor Day. Moorings in the vicinity of the pier are on a first come basis. If full, you can wait and return later, or a Park Ranger can tell you where to anchor. Then you can tour the summer home of Arctic explorer, Admiral Robert E. Peary and/or walk the four-mile trail around the island. Fort Gorges is a former United States military fort built on Hog Island Ledge in Casco Bay, Maine. Built from 1858 to 1864, it was named after Sir Ferdinando Gorges, who in the early 1600s was credited with discovering the land that is now Maine. The fort is open to the public, but it can only be accessed by private boats. Safety upgrades have have recently been undertaken to try to help restore parts of the Civil War-era structure. Visitors explore the fort at their own risk. Harpswell boasts 216 miles of coastline. A town of 200 islands, it consists of Harpswell Neck and the three large islands of Sebascodegan (locally known as Great Island), Orr’s, and Bailey. These are connected by bridges, the most notable being the Cribstone Bridge, the only bridge of its kind in the world. Built from stones from nearby quarries, the large, granite slabs, held in place by gravity only, are heavy enough to withstand the pounding of wind and waves. The open cribbing or cellular construction permits the tide to ebb and flow freely. Light houses, ocean views, walking trails, beaches, fantastic restaurants, historical sites, working lobster harbors and marinas, the rugged coastline of Harpswell has it all. A mom-&-pop eatery/lobster pound on a dock by the water serves up boiled lobsters & fried seafood. The family operated restaurant serves lunch and dinner from May to October. Enjoy fresh seafood inside their dining room or outside on picnic tables under a covered awning. Relax with views of the beautiful harbor and our fishing boats bringing in their daily catch. The restaurant offers fresh lobster rolls, delicious Maine shrimp, clams, scallops and fabulous homemade desserts using handed down family recipes. Enjoy pies, cookies, brownies, Shain's of Maine Ice Cream, and of course, whoopie pies. Also available are standard favorites from the grill for landlubbers. You are welcome to bring your favorite beer or wine to enjoy with your meal. They do have non-alcholic beverages for sale. Their Lobster Pound offers fresh cooked lobsters, steamed clams, corn on the cob and more. You can take live lobsters home with you. They sell packing boxes and gel packs for your traveling needs. Located in Bath, this waterfront restaurant & bar serves fresh, local seafood and American fare. Enjoy straightforward seafood & steak in a relaxed environment. Their spacious deck overlooks the river. Long Island, located in Casco Bay, is one of Maine’s 15 islands with year-round communities. Located 6 miles off the coast of Portland, the only access to the island is by ferry ride, water taxi or private boat. The island is 3 miles long and 1 mile wide, and has a winter population of 200, swelling to over 1,000 in the summer. Many residents, summer and winter, work in the lobster industry. Long Island has beautiful beaches, picturesque harbors, a fresh water marsh, and 125-acre conservation area complete with beavers, a cranberry bog, and forests. Explore spots along the Maine Island Trail, a 375-mile water path for boaters extending along the coast of Maine. America’s first recreational water trail, it connects over 200 wild islands and mainland sites open for day use or overnight camping. Site owners allow access to their properties trusting that MITA members and other users will be responsible stewards during their visits. The Maine Maritime Museum offers exhibits about Maine's maritime heritage, culture and the role Maine has played in regional and global maritime activities. Located at Lat: 43 degrees 53.689', Long: 069 degrees 48.889' - 10 miles up the Kennebec River from the Gulf of Maine. The museum’s Visiting Yachtsmen's Building welcomes boaters with restrooms, showers, and laundry facilities. From late-May to mid-October, the Museum offers a mooring field, floating dock space, and a 75' pier. Excellent restaurants, shopping, grocery stores, pharmacy and other services are minutes away via a pleasant walk, onboard the City of Bath bus, or a short cab ride. Drawn by the timeless beauty of its ocean vistas, Peaks is a favorite summer destination. The most populous island in Casco Bay, it is a thriving artist community with restaurants, sandy beaches, museums and World War II military installations. Rent a bike to explore the island or circle the shore in a kayak. Just up the river from our Freedom Boat Club Yarmouth location, Royal River Grill offers chic, comfortable ambiance and great water views. Their seasonal menus feature generous portions of the freshest seafood, meats and hand-cut steaks combined with the highest quality local ingredients - cooked to order in an open kitchen. From the traditional tastes of Maine to more contemporary fare, their menu has something for everyone. Sebasco Harbor Resort lets you experience the freedom, natural beauty and endless outdoor recreation that are the essence of a pure Maine Vacation experience. Amidst 450 acres of woodland, waterfront, gardens and golf course on Midcoast Maine is a delightful harborside village on Casco Bay. They offer accommodations that vary from cozy to luxurious, and cottages ranging in size from one bedroom to 10 bedrooms – perfect for a family vacation in Maine or ocean side retreat. There are two dining options on the property. Maine fresh flavors are the culinary focus of the Pilot House Restaurant. They provide the best of what the Midcoast region has to offer – all with creative, healthy and delicious results. The Ledges Pub & Patio is the perfect location for casual dining with a view. Enjoy the refreshing sea breezes and watch the boats in the harbor while dining on traditional Maine fare.